By now most Android users are familiar with Google Now, the app that shows you relevant “cards” based on things you’ve searched for: appointments in your calendar, your location and general habits, favorite restaurants, etc. While we’re occasionally creeped out by how closely Google Now watches our daily routine (the reminder popping up that traffic may be heavy for our regular Dunkin Donuts run is helpful, but weirdly intimate), we have to admit that these cards are pretty useful. And now, they’re going to save travelers a lot of money. 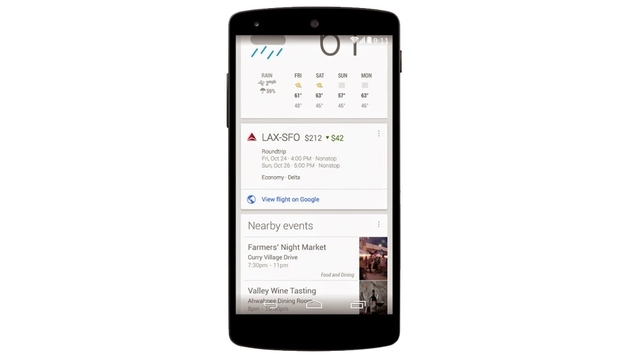 In a blog post Wednesday, Google rolled out the latest feature of Google Now: Flight Search. The post adds that this functionality is currently only available on Android in the U.S. for now if you’ve searched for flights on Google. So if the tradeoff for Google providing us cards by way of profiling us based on our every move online is that we save a few bucks on airfare, consider us OK with that. Now if you'll excuse us, Google has just alerted us that we're late for our regular doughnut run.